The threat to bookstores and the demise of the bigger chains has been well documented as E-readers rise in popularity. Since our last house move (anyone regularly reading this blog will know that we move about as often as we have our cars serviced! ), I've had a whole new area to explore for bookstores, but I have to say, it's been one of the lesser serviced neighbourhoods I've lived in. 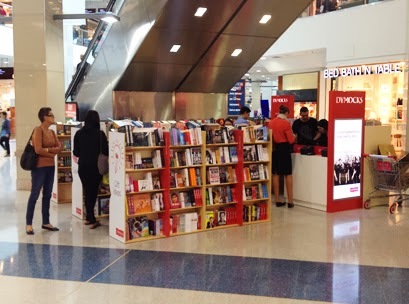 For a while, there was a pop-up of the Dymocks chain in the local Westfield, but on my last weekly shopping trip there, the space under the escalator was bare...it had gone. As far as I can remember, there were no signs indicating that it had a use by date, so I was surprised. It leaves that particular Westfield without a specialist bookstore. The only options now are the ABC shop, Target and KMart, and possibly Myer - the latter being a small version of the department store, and I'm not sure if they have a book department.